This week, OKFoodie was back to its regular night, but has a brand new and beautiful venue. Starting tonight, we are taping the show at Kitchen Concepts at 69th and Lewis. With five kitchens, this is a great new place to call home. Tonight was also special because four food trucks provided the meal and are gearing up for the 2nd annual Eat Street food truck festival that will happen this Saturday, Nov. 9th from 11am-10pm in the Blue Dome District. 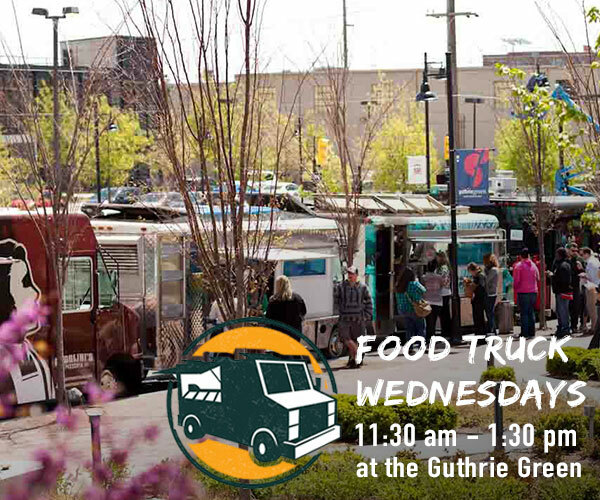 With 21 trucks being represented, there will be something for everyone and a food for almost every taste. Besides food, there will be a kids’ area, music and much more! Tonight’s beverages (beer and pear cider) were provided by Whiskey Business, also located in the Blue Dome District. Dog House, specializing in off the hook delicious hot dogs provided the first course for the evening. Everyone got a sample of two of their popular dogs – The Tulsa and the Mercury. The Tulsa dog got a real kick from jalapeno relish. Bacon, bbq sauce and grilled onions made this little dog one delicious mouthful. The Mercury dog had the same jalapeno relish and raspberry jam for a little sweetness. The dogs were paired with Sierra Nevada Pale Ale. El Gringo Loco food truck provided the next course for the evening. Carne asada tacos were fresh and flavorful with a mango habanero sauce and a good dose of cilantro. Just the right size, these little tacos had a good balance of heat, sweet and meat; they were crazy good! This course was paired with Marshall Old Pavilion Pilsner. Mangiamo Italian food truck made a baked ziti that was full of cheesy goodness. Warm and satisfying with intermingling layers of pasta, marinara and cheese, it was a perfect way to end the savory part of this meal. But, never fear, dessert is coming! The ziti was served with Peroni. Even if we had been stuffed at this point, no one can or ever would dream of refusing doughnuts – especially when they are doused with peanut butter and Sriracha or the quintessential fall flavors or pumpkin and spice. Lick your Lips Mini Doughnuts food truck brought us those two luscious varieties of doughnuts that ended the evening on a very sweet note. Everyone got four little doughnuts that were paired with Ace Pear Cider. The next OKFoodie will be Tuesday, November 19 when Dan and the Cheese Wench will be joined by the three winners of the culinary competitions that were held in July as part of the Home and Garden Expo, Be sure to get your tickets soon at OKFoodie, as this promises to be a delicious evening that you won’t want to miss! OKfoodie is sponsored by Kitchen Concepts, Restaurant Equipment and Supply, Whiskey Business, in the Blue Dome District, KRMG, Reasor’s, Party Pro Rents and Johnny Price Health & Strength Training Systems.